Something is slightly rotten in the state of our fisheries. Or so I suspect. Is this real, or a perception? I would love someone to tell me. I am basing this conjecture on a series of reports. A very recent experience seemed to reinforce it, too. On eating at a well-known fish restaurant, the waitress placed a plate before me containing a parrotfish and a very small snapper. Apart from the fact that the parrot fish was not well cooked, I was aghast. Don’t they know that we really should not be catching and eating parrot fish? And isn’t this poor snapper a mere juvenile? It hardly had any flesh on it. My husband was given a parrotfish too. When I complained to the waitress, she said Yes, they always serve parrotfish, and did not understand why I was concerned. When I talked about this on social media, I had a rude awakening. Yes, all around Fort Clarence and Hellshire they also sell parrot fish, I was told. I was also told (and soon realised) that any messages about parrotfish were simply not getting through to those who catch, sell and cook them. Or, if they were getting through, the messages were being ignored. 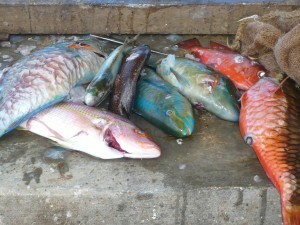 I was told about one fish vendor, however, who only sells snapper and lion fish (an invasive species) – which is good. I am not naïve. I know it takes more than a few Facebook posts and an online article to convince people to lay off the parrotfish. As you probably know, parrotfish have serious teeth. They are herbivores, and they love to graze on coral reefs, removing harmful algae and ensuring the health of the reef. Whatever pieces of coral they might encounter they crunch up with those same little teeth. They poop out the coral and that becomes our ground up (and digested) pretty white sand beach, which attracts our tourists – and which Jamaicans also enjoy and are proud of. All because of this fish, which we are now consuming. Parrotfish and other species caught by spearfishing (Photo A.E. Johnson). 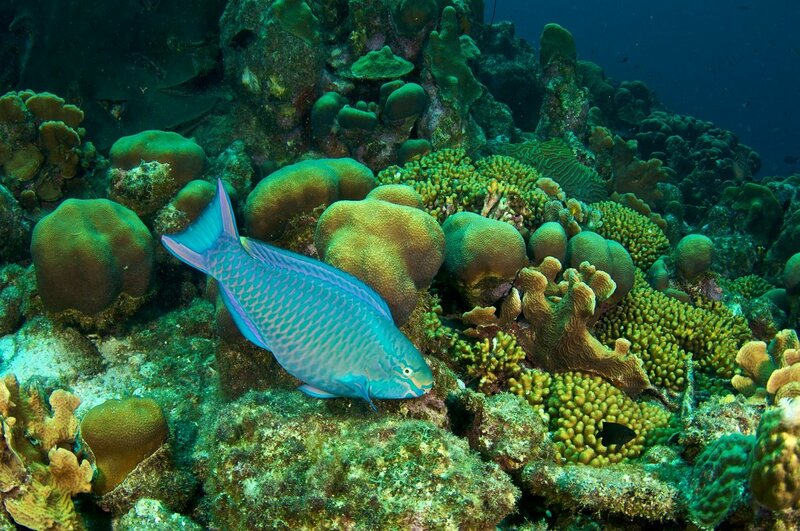 There are many species of parrotfish, but the one we are familiar with is now listed as “Near Threatened” on the International Union for the Conservation of Nature (IUCN) Red List of species. 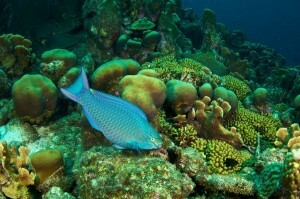 Of course, the parrotfish serves the same purpose globally, wherever it is found. It is a factor in the health of the largest coral reef in the world, the Great Barrier Reef – which is currently under severe stress. The problem is that, on top of this, we have many other new and increasingly problematic issues to contend with: warmer oceans and the acidification of our seas, due to climate change. The fact that we are also polluting our seas with the runoff from agriculture (what are we doing about this?) and sewage does not help our struggling coral reefs. But the main problem, it seems to me, is that there are too many humans going after too few fish. There are bright spots on the horizon. New fish sanctuaries are being established, such as the Alligator Head Foundation in east Portland, which is doing great work and getting local fishermen and community members involved. The private sector is playing its part: some time ago, Rainforest Seafoods announced that it would no longer be selling parrotfish. 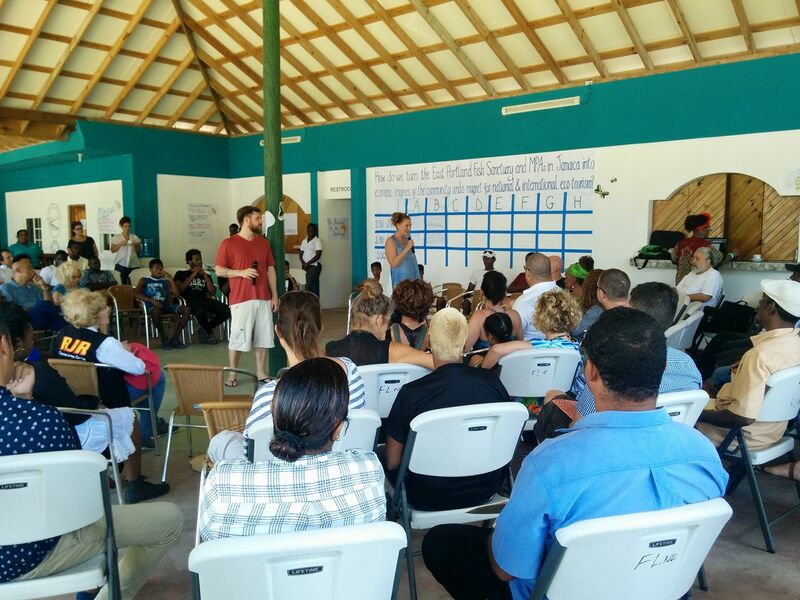 Sandals has recently partnered with the University of the West Indies’ Centre for Marine Sciences on a Parrotfish Research Project, as part of its Save the Parrotfish, Save Our Islands program, which focuses on public education. As a major tourism player, Sandals is well aware of the importance of our coral reefs, upon which so much depends – including great snorkelling and diving for tourists. How do we measure the success of public education efforts, and how is the monitoring of our fish sanctuaries going? Do we have thriving nurseries now? Are all our fish sanctuaries being strictly monitored? I know those who manage them have to patrol them to ensure there is no poaching – and no doubt there is some poaching of the small fish that are trying to reach maturity in those protected areas. And is any effort being made to offer alternative livelihoods to fishermen who are finding fewer, and smaller fish in their nets? Are the size of nets regulated and monitored? Don’t we simply have too many fishermen now? What about fish farms and aquaculture – I haven’t heard much about that lately? It seems ironic to me that the vendors of Hellshire, still selling parrot fish, no longer have the white sand beach (for a number of other reasons, too). That beach dazzled me when I first saw it, back in the 1980s, when it had already resulted in many people making good money out of selling their famous “fish and festival.” The place was buzzing, back then. Now, I am not sure if there is anything left of Hellshire’s reef, and suspect that the fishermen, who used to pull their boats right up on that beautiful wide beach, are searching much further and wider than ever before. And what of the “big boats” – the Hondurans and others who are from time to time picked up in Jamaican waters? Do they sell to the smaller fishermen? How are the Pedro Cays doing? How is all of this being monitored? This is an important aspect of border security, too. More than 85 percent of the world’s fisheries have been pushed to or beyond their biological limits and are in need of strict management plans to restore them. Much research has been done, and it is well known that Jamaica has one of the highest levels of overfishing in the Caribbean. Let us find solutions, and fast. Over to you, Ministry of Agriculture and Fisheries.